Class Zero represents the best air quality possible. 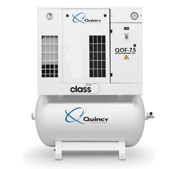 In critical environments, it is essential that the compressed air is 100% oil-free. Contamination by even the smallest quantities of oil can cause costly production down time and product spoilage, resulting in product recalls and loss of reputation. 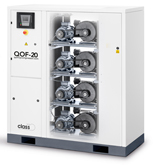 The new Quincy QOF 2-30 oil-free scroll compressors meet the Class Zero standard and also provide top class performance, premium efficiency, and quality. 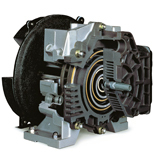 Outstanding reliability, low maintenance, and operating costs make oil-free compressors a sound investment.